Both moody and bright simultaneously, Ultra Violet suits most spaces as both a secondary or dominant choice. In classical settings, Ultra Violet brings a touch of decadence, especially when combined with luxe materials such as leather and dark wood. Teamed with organic textures and lush foliage to add a touch of mystique and bohemian intrigue to your space. Tint ultra violet to bring out smokey Amethyst tones which soften a room while enriching it with character, often highlighting warm tones such as copper vessels and brass fixtures. Unsure? Invest in Ultra Violet velvet, be it cushion, upholstery or curtain. Colour has been linked to emotions and psychology for centuries, and can add their own feeling to a room without any other influence. For this reason, successful interior design relies heavily on the ability to match, contrast and reflect colours that invoke the right mood for the right space, as well as looking pleasing to the eye when combined. Apart from the walls, the floor space of a room is one of the biggest canvases to use in interior design. 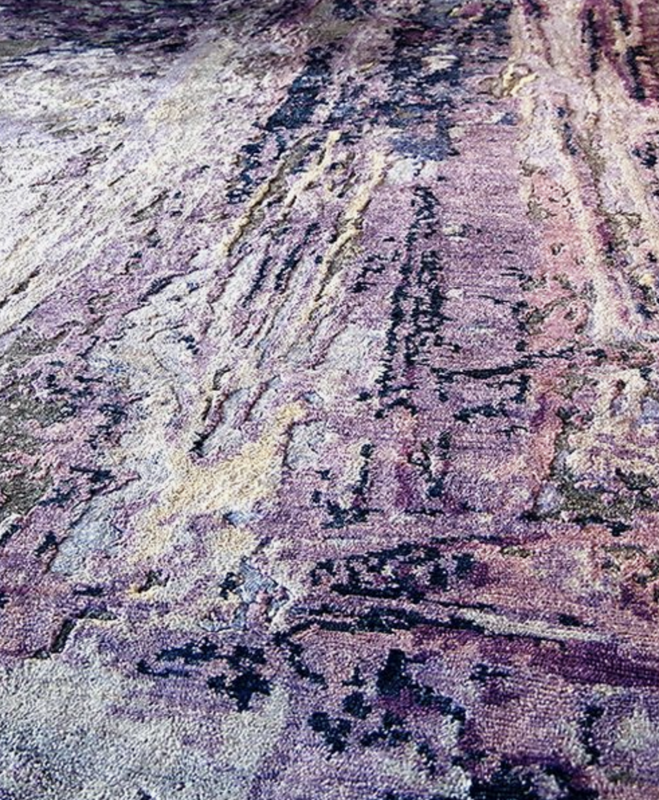 Beyond the soft underfoot feel of a quality rug, the colour choice you make for your rug can have huge prevalence over the success of your design. Beyond colour, texture and size is also important, which we outline in our Choosing Your Rug page found here. The wheel consists of three types of colours, which are broken into Primary, Secondary and Tertiary colours. We can further influence colours by adding a neutral tone (Black, white or a mix of both) to a Primary, Secondary or Tertiary colour. Apart from true neutrals, colour can be described as being "warm" or "cool" depending on the mix within the colour to influence it's outcome, and the placement of the colour on the colour wheel. WARM COLOURS: Reds, oranges and yellows are generally considered warm colours. They add brightness and vivacity to a colour, creating the difference between a dun brown and a chestnut brown - the prominence of yellow and red in the chestnut brown adds depth and as a result, warmth, to the colour. COOL COLOURS: The influence and dominance of blue in a colour usually dictates the color to be considered a "cool" tone. For example, a green can be warm (e.g Pantone's Colour of the Year for 2017 "Greenery") as it has a great deal of yellow in it, whereas more blue will make the colour closer to a Pine green or Army green, cooling it down. A complimentary colour scheme takes two colours that sit directly across from each other on the colour wheel, and in the case of Split Complementary, a second shade is chosen close to one of the original shades to add depth to the scheme. Slightly more complicated, triadic and tetradic schemes bring in a third (triadic) and fourth (tetradic) colour but unlike split complimentary, all colours are an even space apart on the colour wheel. Triadic schemes are often seen in spaces for children, with the colours usually being bright, happy primary colours that add an extra pop to the design. Tetradic colour design can use brights, but may also tone down to suggest age or history, such as design influenced by Indian, South American or Nepalese design. If we look beyond the science of the colour wheel, colours have always held significant meanings dependent on culture and country. For example, through a Western eye red may be an aggressive tone, Red in China is considered a colour of luck and favour, with many traditional wedding dresses made in stunning red hues to bring luck to the new couple. Generally speaking however, we can divine a general meaning to each colour and the mood it sets based on its psychological impact to humans at large. BLUE: Intellect and communication. Promotes calmness, clarity, serenity and efficiency. For this reason, blue is a popular colour for workspaces, and compliments well with whites and beiges. GREEN: Refreshment and peace. Earthy, harmony and balance. Green sits in the centre of the spectrum to the human eye, meaning it requires no further balance from the brain: Long story short, green is naturally restful to the eye and is a soothing and organic tone to use. YELLOW: Emotions and positivity. Yellow is creative, friendly and encourages extraversion and good self esteem. Modern design sees a great use of canary yellow teamed with trendy grey, suggesting a stylish pop of happiness to a space that is otherwise neutral. RED: Physical energy and stimulation. Considered a masculine colour, red is about courage, strength and excitement. For this reason, you can find a lot of bold uses of bright red in gym branding and interiors, to get patrons motivated and physically pumped. 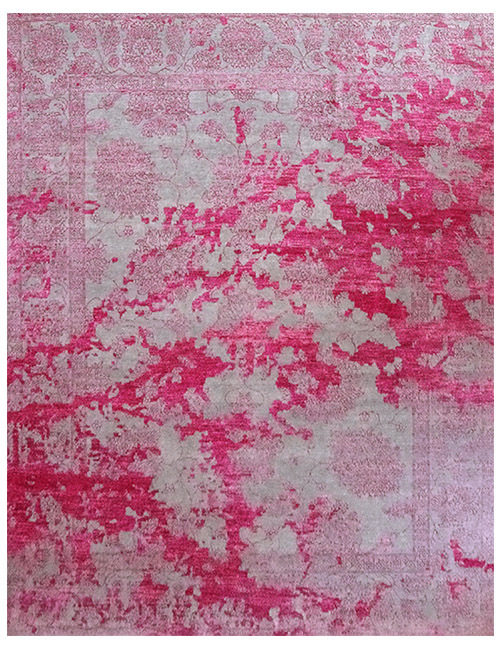 'Melody' rug in Rose/Grey. Hand knotted bamboo silk and wool blend. PINK: Tranquility, nurturing, warmth, love, sexuality and vulnerability. A tint of red, pink soothes rather than invigorates, but is best used as an accent - too much pink can quickly feel claustrophobic and physically draining. BLACK: Sophistication, seriousness, efficiency and substance. Clearly popular in up market establishments, black quietly suggests power and menace, adding a calculated chic look to any interior.